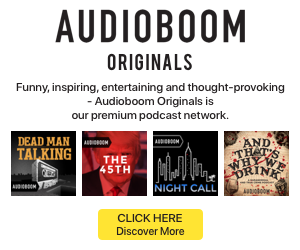 When audio ads are accompanied by so-called companions (visual banners, usually) the companion is almost always an active link with a call to action. 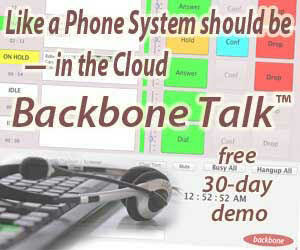 Normally, this direct response element leads to a product-oriented landing page. One typical example: a local car dealer’s website with a particular model featured, and some kind of interactivity that keeps the user engaged. Some brands are hungry for social engagement, as much as product engagement. Getting a user to build a car package on a dealer’s website is clearly a good return, but getting a user to follow a Twitter account might keep that person engaged over time. That’s the thinking of McDonald’s, which is running audio/companion ads on Pandora that lead to uniquely persistent connection with regional Twitter feeds. We encountered the ad while power-skipping around Pandora (our favorite method for eliciting ads). The audio commercial promoted a menu item. 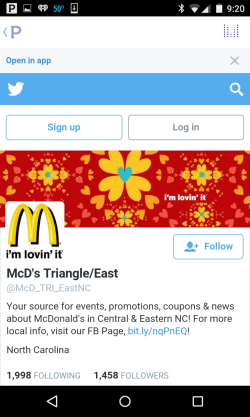 Touching the companion banner (in an Android phone) led to a regional McDonald’s Twitter feed where localized promotions are featured. Interestingly, and uniquely in our experience, the Twitter landing page persisted within the Pandora app, rather than sending us into the Twitter app which was installed on the phone. We let that McDonald’s experience sit on the screen for over an hour while continuing the Pandora listening session.